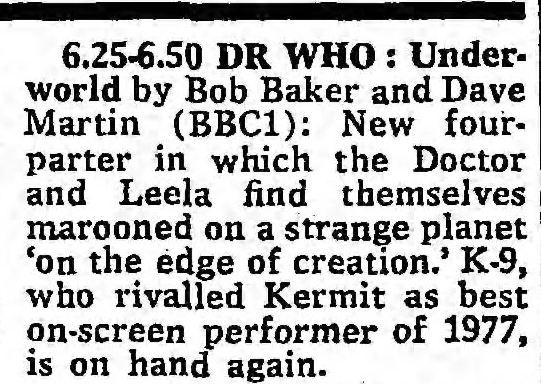 6.25-6.50 DR WHO : Underworld by Bob Baker and Dave Martin (BBC1): New four-parter in which the Doctor and Leela find themselves marooned on a strange planet 'on the edge of creation.' K-9, who rivalled Kermit as best on-screen performer of 1977, is on hand again. APA 6th ed. : Gilbert, W. Stephen (1978-01-01). Underworld. The Observer p. 24. MLA 7th ed. : Gilbert, W. Stephen. "Underworld." The Observer [add city] 1978-01-01, 24. Print. Turabian: Gilbert, W. Stephen. "Underworld." The Observer, 1978-01-01, section, 24 edition. This page was last modified on 8 April 2019, at 00:14.